The Republics is a massively brilliant new work. It’s gripping, harrowing, and at times horrific, while its form paradoxically is fresh, luscious, and original. Handal has recorded like Alice Walker, Paul Celan, John Hershey, and Carolyn Forché, some of the worst civilization has offered humankind and somehow made it art. A startling piece of work. It’s one of the most inventive books I’ve read by one of today’s most diverse writers. These ‘flash reportages’ by Handal offer us new ways to think about both poetry and journalistic documentation. Handal is a singular creature: An international nomad whose work explores the innermost quadrants of the self and has a genius for letting all voices, however discordant, be heard. This is poetry of the most original and ridges kind." Following Césaire, Handal’s poems are an act of looking at what is difficult. I cherish these dense little constructions – they are full of hard truths, of things seen in extremis, and yet they do not leave us comfortless. Her gorgeous words, like the griots of old, the nomads of the deserts sands, all of whom roam in her blood. Particularly inventive, as Handal uses a variety of monologues, narrative or prose poetry, and ‘flash fiction’ to explore questions of home and personal relationships. While alternating stylistically between the narrative—tinged by the Romantic tradition—and the slightly surreal, much of Handal’s work is also marked by various forms of fragmentation. Within poems from all her collections, she often deconstructs the bodies of her subjects into their parts and houses into their elements: doors, walls, and windows. In Poet in Andalucía, Handal places her poetic self in a single geographic area—southern Spain and northern Morocco—for the first time. Perhaps the collection’s most intriguing poem is “Alhandal y las Murallas de Córdoba.” A meditation both on the etymology of the poet’s name and the source of identity, it is one of the few pieces in which Handal, a frequent visitor to the past, uses the future tense: She sifts through the Andalusian landscape, sifts through her memory, ponders her own future disappearance, investigates the appearance of her name on a Spanish announcement spelled in a way she had seen previously only in her native Bethlehem. In her journey she finds “things no one can take away”: “the taste of date on our tongue”, “the poems of the Sufis”, Córdoba’s legacy of tolerance, the Spanish language, orange trees, and her own name and its origins—the colocynth, a bitter medicinal plant used by Arab apothecaries. Handal’s work, so beautifully protean, has questioned and examined what can be lost: a country, languages, a missed rendezvous between lovers, the music of the earth. The transitory nature of life is common to the human experience—the bitter apple we all taste: so much of what we live and who we love just disappears. Poet in Andalucía recasts southern Spain through Handal’s eyes, exploring impermanence but also possessing a sense of ojalá. Some things can and do endure. This book, and its author, are a treasure. It’s exceptional to find something as cohesive and engrossing as Poet in Andalucía. I highly recommend it and await Handal’s next journey. Handal’s newest collection is an ambitious work. These poems make a beautiful reality for the poet, and for us, which is truer than mortar and brick. It’s with startling force that Handal builds an architecture for the wanderer. Poems of depth and weight and the sorrowing song of longing and resolve. Nathalie Handal’s brilliant new volume of poetry, Poet in Andalucía — about Spain, about the Middle East, about shared destinies and hopes — touches me deeply: it reminds us of what’s inconsolable, of what’s multiple, of what’s irreducible, and what’s simultaneous. Poet in Andalucía will be one of the most talked about poetry books of 2012, and beyond. Poet in Andalucía will fascinate readers with its endless journeys through national, literary, and personal identity. It’s an intriguing work. That duality — the mix of simple and complicated — helps make this collection a notable addition to contemporary poetry. Looking at her poetry, I found a voice emerging in an honest, stripped language, and though it seems focused – narrowed — her poetry contains a quality of surprise that gives it an air of the other-worldly, the mysterious. There is something incredibly sincere about Nathalie Handal and her poetry. That seems like a rare thing in literature in the United States today. Perhaps that is because Handal is not exactly from the States: she is a world poet. She grew up in several different countries on different continents and learned their languages. Like Rick Blaine, Nathalie Handal is a citizen of the world. Yet, unlike Blaine, Handal is a brilliant, poetic chronicler of the human condition and a philosopher of the most lyrical reaches. Known as a poet on the move, Handal provides the reader a beauty of language and image that unwaveringly commands attention. In Nathalie Handal’s brilliant new volume of poetry, Poet in Andalucía. her eye abolishes time, combing all pasts into the resonant folds of the present. That metaphor of splitting, of one half running up against another, divided by a tenuous border, recurs in her collection. 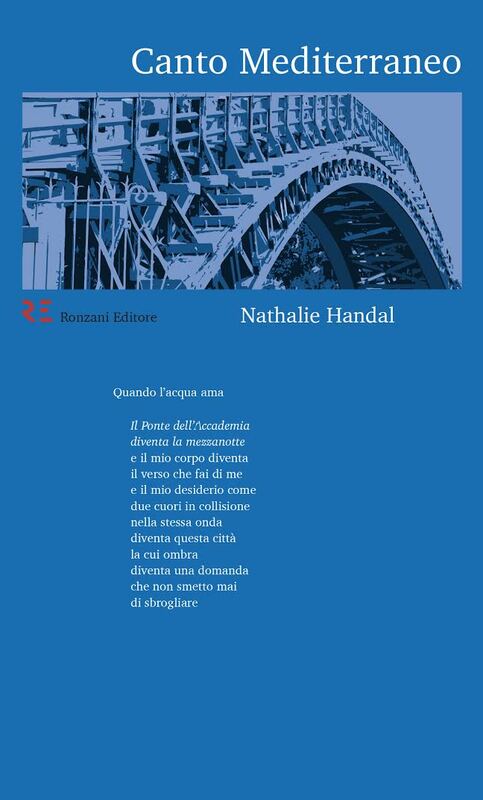 If there is such a thing as a Renaissance figure among poets writing, that person is Nathalie Handal. Trembles with belonging (and longing). In Nathalie Handal’s book Love and Strange Horses, this important young poet addresses the need we have as humans to relate to each other, to work for the genuine intimacy she believes is vital to life. Her work is a brilliant elegance. To find a similarly fresh and innovative look at the old subject of love in a book by a young poet, I would have to turn to Neruda. Nathalie Handal’s Love and Strange Horses is riddled with provocative incantations that verge on a conjuring solidly based in this world and beyond. There’s a subtle singing locked inside each poem that raises the stakes. This cosmopolitan voice belongs to the human family, and it luxuriates in crossing necessary borders. The pages are lit with scintillations that transport the reader to pithy zones of thought and pleasure. Sometimes we have questions that seem to defy answers or even suppositions but then we find Love and Strange Horses to help us map out a course to continue loving life. A really wonderful, thoughtful read by an intriguing voice. Love and Strange Horses is a densely-textured book… As a young and inventive poet who sees herself as world citizen, Handal's insightful perspectives on the polarities of desire and love's potential for healing are not only heroic, they are valuable. A well-crafted example of what the contemporary poetry world has to offer. Handal, a French-American who has lived and worked all over the world, brings us a vivid narrative, using colorful, sometimes heart-wrenching language. Handal's ear for language and ability to see the world a little differently than most people sets her apart from some of her poet peers, making Love and Strange Horses a book certainly worth reading. The cadence of Nathalie Handal’s voice resembles her nomadic life… her voice has the mellifluous tinge of a French accent. Handal’s lyric poetry is riddled with the music of questioning. What is strength? What is love? Her poems do what poetry does best. They call us to question and own our humanity, clear-eyed, staunchly, regardless of culture, religion or gender—like a candle burning, softly vivid, a pure flame on the table of our global human tribe. High-Octane poetry, an intense and committed personal poetics . . . we should thank her for the space and energy of this book. With a journalist’s eye, a blind man’s ear and a troubador’s voice, Handal creates tableaus of lovers who seem always to be looking for love, even when they have found it. They yearn for love, approach it, confront it. She writes about the gentle pathos of love with the same fearlessness we find in her poems of exile, isolation and war. Her irresistible charm comes through on every page as it does in person. It is a privilege to be able to read her verses. On every page is a discovery, and with every discovery, another one waiting. Her distinctive poetic voice takes her around the globe. And indeed she should be celebrated and read. Nathalie Handal es una de las nuevas voces poéticas más significativas de la literature contemporánea. In The Lives of Rain, Nathalie Handal has brought forth a work of radical displacement and uncertainty, moving continent to continent, giving voice to Palestinians of the diaspora in the utterance of one fiercely awake and compassionate, who, against warfare, occupation and brutality offers her native language, olives, wind, a herd of sheep or a burning mountain, radio music, a butterfly’s gaze. It is a poetry of never arriving, of villages erased from the maps, of tattoed waistlines and kalishnikovs, a goat and a corpse cut open side by side, where every house is a prison. In a spare, chiseled language without ornament, she writes an exilic lyric, fusing Arabic, English, Spanish and French into a polyglot testament of horror and survival. Habibti, que tal? she asks of those who wander country to country, while those left behind in Jenin, Gaza City, and Bethlehem inhabit a continued past of blood/ of jailed cities. Her subject is memory and forgetting, the precariousness of identity and the fragility of human community; it is the experience of suffering without knowledge of its end. Handal is a poet of deftly considered paradoxes and reversals, sensory evocations and mysteries left beautifully unresolved. Hers is a language seared by history and marked by the impress of extremity; so it is suffused with a rare species of wisdom. Handal is an important and eloquent voice whose poetic vision is as rare as it is necessary. The Lives of Rain is a book of exile and wandering, geographically and emotionally. In it are wars, loves, scars, ancestors. In it are olive trees, lemon trees, weddings, music, fear. In it are English, French, Arabic, Spanish, "the breath of cities," the blue hour of a woman's body. Nathalie Handal is a poet for our time of crisis and need, for our awakening sense of the battles of eros and thanatos in our world. Some poets have a fire in the belly, an urgent need to tell the truth for the sake of those who do not know, and those who do. Nathalie Handal is one such poet. Yet her poems transcend the fire of their birth: there is also a cool intelligence here, the words of a witness who will tell the story and get it right. These brave, sensual and striking poems humanize the Palestinian people at a time in history when they are too often dehumanized. Gracias, Nathalie. Nathalie Handal's poetry is a global poetry of witness and wisdom. The weightiness of her subjects is delightfully at odds with the buoyancy of her cadence. In The Lives of Rain, Handal's crisp multi-lingual diction renders passion, intelligence, and despair, deftly chronicling the human condition in its vivid particulars. In The Lives of Rain we catch the accent and the stress of displacement, of being in the wrong place, ‘shadows behind shadows’ - Nathalie Handal's exilic tone stays and roots itself. Great writing, hard, moving, tough, real. The Lives of Rain reminds me of an essay by Edward Said [Reflections on Exile]. The melody is mine, belongs to the reader, as I am also this hatless man: his maps his books, his memories his exile his half-forgotten name on a bench by the river...Une vraie poétique du déplacement, sensuelle, érotique et (pourquoi pas) politique. The Neverfield is work which insists on itself. It is a poetry of a shining quality from a poet whose voice is sure and unafraid. The Neverfield is an epic journey, a passionate search for beauty and truth. If beauty is truth, and truth is beauty, the poems in this volume lead us once again to that realization. The Neverfield is an enchanting work, sharing with us a poet's true vision. Nathalie Handal's poems in her collection The Neverfield are wide as breath, lyrically linked as an elegantly stitched Palestinian bodice, the first time we hear them. As I turned the pages of this work, I was reminded of how vast the universe is. The Neverfield is everlasting by nature. After reading it, I breathed deeply and praised the word. This is a holistic piece of work. This is an ambitious debut. Nathalie Handal embarks on her poetic career with a lyric epic utilizing intriguing surreal imagery and a passionate tone to explore the existential bewilderment of her exile. Lucid, vibrant, and charged, Nathalie Handal’s poetry is suffused with a sense of place and culture. Her writing in international in scope, its soul is deeply alive.